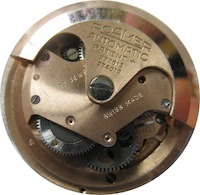 Remarks: Meyer and Stuedeli SA (MST) first in-house automatic. A very important movement for MST. Features innovative and efficient bidirectional rotor winding, and decoupling of manual and automatic winding mechanisms the subject of 2 new patents with elements carried though to later movements.